That pic shows a great single anecdata point. Now, will you show the data when the inevitable happens? #InducedDemand (see Induced Demand Proven ) makes this money spent a waste? And those cheering today will just be asking for another billion or seven to be spent on the next expansion? We don't need another extortion toll lane or a shoulder lane. We need the general purpose lanes we were originally promised in the original master plan. The extortion toll lanes have been one of the biggest mistakes in transportation history. 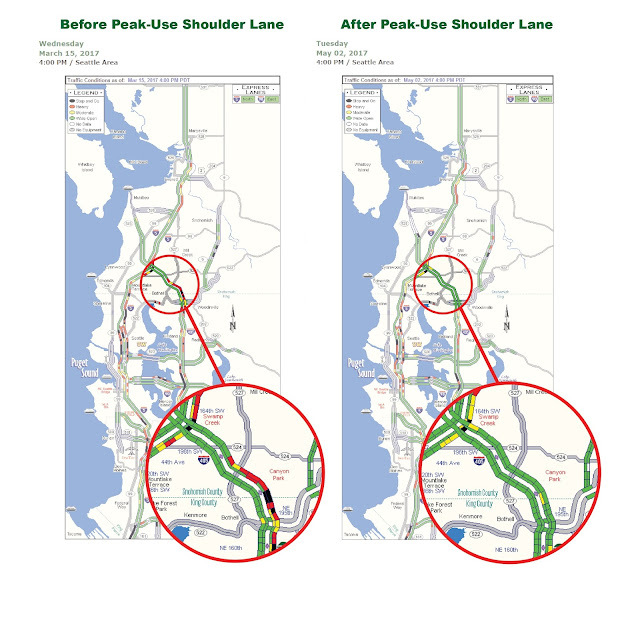 They continue to cause congestion and WSDOT will continue with there deception, propaganda and lies. If you really wanted to help with the congestion you would 1) do away with the failed extortion toll lanes. 2) add the much needed general purpose lanes we desperately need. Glen, yes, we will share data. The peak-use shoulder lane was a relatively quick fix to an emergent problem. We have long-term plans to extend the second express toll lane in each direction from Bothell to Lynnwood, which is a sustainable way to manage demand for highway capacity. I simply cannot understand how our tax dollars are used to build the public infrastructure, yet we still need to pay an additional fee to use 3/5 of the highway? What kind of society do we live in?